A blustery winter snow storm, descending from the north, ushered in the new year. All lines of delineation were erased from the landscape. The shoreline merged with the snow-covered lake and the stones of the terrace blended into our white house. Milky cream clouds painted the horizon and heaven and earth were one. As a gentle breeze smoothed the meadow I accepted the challenge of disturbing the symmetry by attacking a path with a snow shovel. The pebble walk emerged, piles of snow on either side. The way was now clear to walk but the perfect white covering had been broken. Children opted for other activities, leaving the imprint of their tracks on the hill where the horses, Elgar and Pokémon, dressed in tan winter coats, nibbled hay scattered under the overhang of the red barn. Ricky, Susie and Sharon gazed at the smooth snow covering and suddenly little Ricky dropped to his knees, stretched out on his back and sunk into the snow. He extended his legs to either side and swept them back and forth, repeating this movement with his arms. Then he stood up and admired the snow impression he had made. 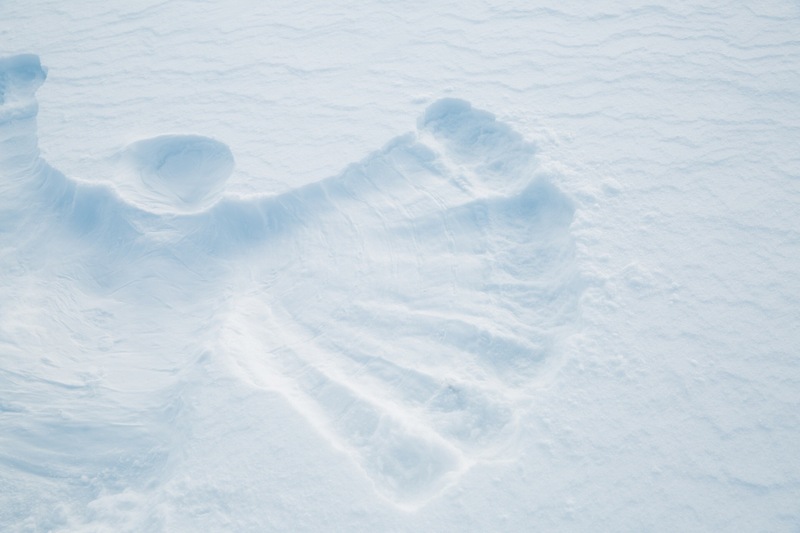 With the shape of wings and a dangling robe there was now the imprint of a six-year-old angel supine in the snow. A portion of the meadow, once virginal, had been transformed into Angel Ricky who, according to his parents, did not necessarily fulfill that role. Then again, how do you fashion the image of a snow devil! Incidentally, for any reader interested in snow angel trivia, which, I would assume, includes almost everyone, the record for the most snow angels created in a single day stands at 8,962 on February 17, 2007, in the town of Bismarck, North Dakota. Guinness does not mention how many people gathered on the grounds of the state capital to amass that mess of snow angels! Near Ricky, aka Snow Angel, Susie and Sharon were rolling a small snowball downhill. Faster and faster the snowball sped, gathering snow for the bottom of a snowman. Soon a second ball, smaller in size, would take its place on top of the original ball and, finally, a third would be converted into a head. Elgar, the Fresian horse, looked on in envy as a luscious orange carrot emerged out of the snow head and created a nose. What a waste of a perfectly good carrot! Sliced red peppers provided lips and plums were surrogate eyes. Five and Dime store gold jewelry dangled from the snow girl’s neck, partially hidden by a green and black plaid scarf. This was the epitome of a snowgirl: stately, poised, a little off center, destined to last until the thaw that was predicted for the next day. I stood watching and with my penchant for discovering meaning in all of life, I concluded that the snow storm had conveyed promise for the new year. The snow shovel had brought order to its immediate world. The snow angel shaped the new year into an idyllic concept of what an angelic year could look like, and the builders of snow men (and women) suggested that we can fashion ourselves to be whoever we wish to be. Even if we prefer a real nose to a carrot. So what are your dreams for 2017? Do you wish to bring order to your life? A clearer path ahead? Do you wish to shape an even better year or do you wish to fashion a new (or somewhat revised) you? Whatever your decision, Happy New Year. January 1, 2017 in Brant Lake.